What do you think you deserve? Do you want something and yet, don’t really feel deep down you deserve it? Is it love? Is it money? Is it creativity? Or do you worry you do not have it or enough of it? 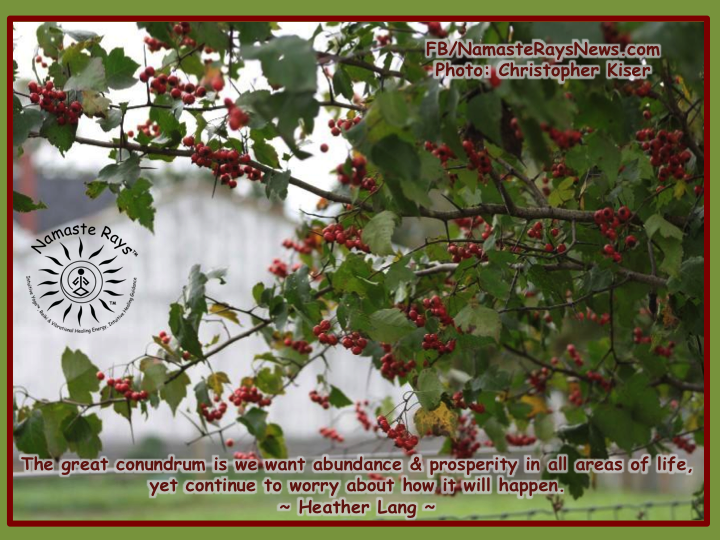 The great conundrum is we want abundance & prosperity in all areas of life, yet continue to worry about how it will happen. The great conundrum for so many is that we want abundance, and yet we constantly worry about what we may or may not already have in our lives. We worry how we will have enough money to pay the bills. We worry when the person we are meant to be with will appear. We worry we are not as good, likable, strong, courageous, etc., as the next person. This type of thinking creates lack. It doesn’t help us receive abundance in love, money, friends or whatever it is we want in our lives. When we worry, we are telling the universe to not send us abundance as our thought energy says “I do not have THIS”. We must recognize we have everything we need. We have abundance and we are prosperous. We need to begin thinking in the present moment we have exactly what it is we want. For instance “I have plenty of money to pay my bills”, or “I have an enormous amount of love in my life”, or even “I’m just as intelligent as another.” Our society has created this feeling of lack…that we never have enough, or we aren’t good enough for whatever reason, when the complete opposite is true. There is not a finite amount of money…there is plenty to go around. Everyone is intelligent and perfectly suited to do what they need to do in their unique way. Everyone has plenty of courage and strength within them. Everyone is good and likable. It’s important to THINK, ACT and FEEL as if you already have the abundance and prosperity you want and need…because you do! Thinking in this manner is manifesting your exact needs, desires & wishes for the abundance & prosperity the universe will deliver to you. The universe matches like with like…so if you worry you don’t have enough, you won’t. If you think you have plenty, you will. May you start and continue to know you have the abundance you do.